Take a gander at the cover of Becca Fitzpatrick's Silence, out Oct. 4! Dearest readers, life has been crazy lately. And I do mean seriously crazy. Before I give you my tidbits (isn’t that a fun word?) I’ll give you a very brief list of my most-recent woes. I apologize for temporarily abandoning you, but I think things are slowing down now so I’ll work hard to continue being your YA lit resource. 1. Read Cassandra Clare’s City of Fallen Angels. The story didn’t really grab me until around the middle and in the meantime, I was dealing with Magnus’ absence (I LOVE Magnus) and Jace’s identity crisis/weird dreams/whining. Bring on the cocky Jace for the next one, Cassie! What did you think? 2. Read Kelley Armstrong’s The Gathering. Again, not as impressed by this one as I was by The Summoning, which was creepy, scary and wonderful. The Gathering had an interesting story, but it was pretty obvious what was going on for most of the book. The ending was a bit anticlimatic as well. Again, I want to know your thoughts…what did you think? Was it as good as the Darkest Powers series? 3. 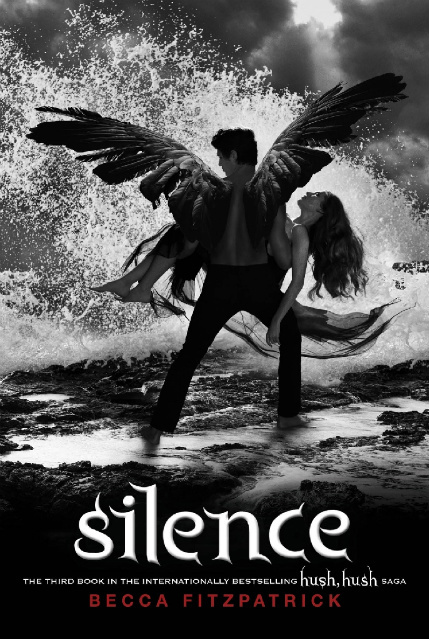 I’m in love with the recently-revealed cover for Silence, the third and final book in Becca Fitzpatrick’s Hush Hush series. I’m a Patch fan, and while the second book gave me too much of Nora’s ridiculousness without enough of Patch’s more reasonable self, Crescendo ended with a bang and I’m dying to read Silence. How did Crescendo strike you? 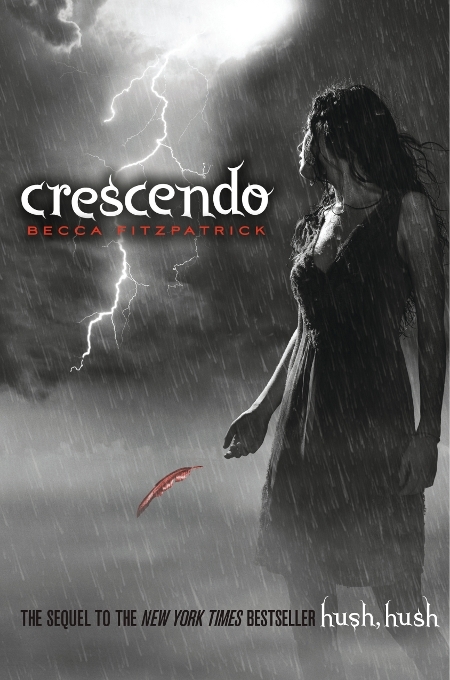 Pick up Crescendo, the sequel to Hush Hush, Oct. 19! Visit beccafitzpatrick.com for more info and the playlists that helped inspire the books. God created the heavens. Then He created the Earth. Then He created Patch. Fans will get to read more about my favorite guardian-angel/human couple in Crescendo, the sequel to Fitzpatrick’s titillating first novel Hush Hush, which will show up on your local bookshelves Oct. 19. Last we saw Nora Grey and Patch, the once-fallen angel had transcended his age-old punishment by refusing to accept Nora’s life as payment for his humanity. Patch turned it down, becoming Nora’s guardian angel instead. Crescendo picks up a few months later and starts right away with serious action – not only between Nora and Patch, but also with other players in Fitzpatrick’s universe, including his old co-workers, the archangels, who are looking for a reason, any reason, to send Patch to hell. Soon doubts come between Patch and Nora, leaving her wondering how well she really knows her guardian angel – especially when popular rhymes-with-witch classmate Marcie, and Scott, Nora’s childhood “friend,” start showing up more often that necessary. Complicating matters even further is Nora’s father, whose death is a mystery that she feels compelled to unravel. Like its predecessor, Crescendo will fuse itself to your hand and refuse to be put down until it’s finished – the novel’s a heart-pounding, heart-breaking and heart-attack inducing followup with so many plot twists, turns, trap doors and see-through mirrors that it will keep you guessing until the very last page. Nora is easily relatable as the girl who’s unsure of her hold on a mysterious being such as Patch – what she goes through in this novel is very realistic for any girl in her situation (I could see myself on a risky diary-stealing mission). Patch seems to be his usual charming bad boy self, but the way Fitzpatrick weaves her tale makes you question everything you think, or thought, you knew about him. One thing we know for sure about Patch: he’d do anything for Nora. Fitzpatrick effectively throws a complicated wrench in the Nora/Patch mix with ugh – more Marcie Millar and the threat of archangels. I warn you: you’ll have a strong urge to punch Marcie in the face. Crescendo adds depth to the Nephilim saga with more fallen flashbacks, the entrance of the mythical Black Hand and the questions raised by the visions of Nora’s father – and Patch’s possible involvement in his death. One issue I have with not necessarily Crescendo, but whoever wrote the book jacket synopsis: it makes Scott Parnell, Nora’s sort-of childhood friend, seem a little more important than he actually is. The more I saw of Scott, who I found to be unlikable, one-dimensional and brutish, the less I wanted to see of him, especially with Nora. My other issue? Patch. Let’s see MUCH more of him next time. Like the word, Crescendo upped the ante, action and story. Crescendo was a fantastic book, so much so that I couldn’t stop reading; I finished it in about four hours. The ending is fingers-gripping-book good and sets dedicated readers up for some excitement in Book 3, Tempest.